With my girls off babysitting today and my son helping my hubby chop wood all afternoon, I enjoyed a Sunday afternoon watching a Law & Order: SVU marathon that I had recorded on the DVR. A warm, crackling fire? Check. A cup of Sleepytime Herbal Tea? Check. My favorite Nonni's Caramel Milk Chocolate Biscotti Bites? Check. Comfy yoga pants and fuzzy socks? Check. Stabler and Benson on my t.v. screen? Check. It was an afternoon of pure bliss. Oh, and I made dinner. This is such a simple recipe as it is written. But, it is easy to adapt it to suit your preferences. Round or square ravioli can be used. Refrigerated "fresh" ravioli can be used or you can use frozen ravioli. I keep this vegetarian, but you can layer in cooked ground beef or sausage. And, adding in fresh spinach or mushrooms, for example, makes this super hearty and gives you another layer of flavor. Preheat oven to 375 degrees. Coat a 10 - 12" round or 9 x 13 casserole dish with non-stick spray. Set aside. Bring a large pot of water to boil. Liberally salt water once it comes to a boil. Drop the pasta in and cook for 3 - 4 minutes ... no longer. (Do not cook for the length of time stated on the package.) Stir the pasta a couple of times while it cooks. Spread 1/3 of the marinara sauce into the bottom of your baking dish. 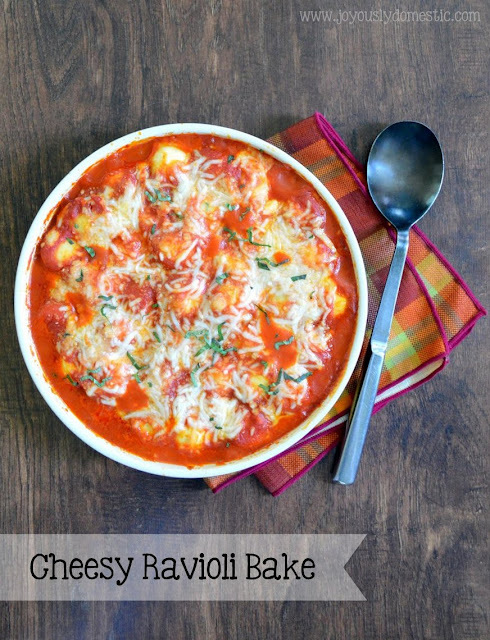 Place half of the par-cooked ravioli in a single layer on top of the marinara. Spread another 1/3 of the marinara onto the first ravioli layer. Sprinkle on the shredded mozzarella in an even layer. Top with the remaining ravioli in a single layer. Spread the remaining marinara sauce on top of the final ravioli layer. Sprinkle on the grated Parmesan cheese. Place the fresh mozzarella around on top. Sprinkle on the shaved Parmesan. Remove foil and continue baking for an additional 5 - 10 minutes or until everything is nice and bubbly. NOTE: This can be made utilizing frozen ravioli. It will need boiled just a few minutes longer than fresh. 08/09/16: Updated main photo and made clarifications to post. This looks wonderful!! Can't wait to make! This has become a favorite in my house. I saute eggplant, spinache, onions, and mushrooms and layer them in between. Absolutely delicious! This looks great. How many servings is this and do you have nutritional info on it? This looks decadent! Thank you for sharing. This looks great, I think my family will love it. What size jar of marinara sauce do you use? Hi, Lilly. I believe the jar is around 25 ounces. :) Hope you all enjoy the dish!